Speed:Features Intel Core i7-2630QM Quad Core 2.0 GHz Processor. The speed is lightning fast, ideal for intense gaming. Storage: Offers huge storage capacity with a 500 GB hard drive. Hard drive speed is 5400 RPM which is normal for laptops. Could have been better if it had 7200 RPM hard drive for faster data retrieval. Memory: Amazing 8GB DDR3 SDRAM. More than enough RAM to do any type of multi-tasking. Will run Windows 7 and most applications without any slowdown. DDR3 offers faster memory speed. Display: 15.6″ Display, huge 1600 x 900 widescreen resolution. Has LED Backlit display which conserves battery life. Optical Drive: Comes with 8X Dual Layer DVD Writer. Can make DVDs upto 8.5 GB in size. Graphics: Features NVIDIA GeForce GT 540M dedicated 1 GB graphics memory. Great for playing 3D graphics intensive games. Wireless: Features integrated 802.11 b/g/n adapter. 802.11N offers stronger signal reception. Also has an ethernet port. 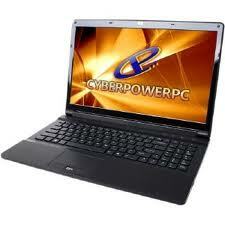 This Cyberpower PC Gamer Xplorer laptop is bluetooth 3.0 capable. Others: Has built in webcam and microphone. HDMI connection allows connecting the laptop to HDTV. Has built in memory card reader. Battery: 6 Cell Lithium ion Battery. Estimated battery life is up to 4 hours. Overall Rating: Ideal for gamers, students, home use and business use. 2.6 kg is bit heavy though to carry around. Look for a price near $850 to $950.